Have you ever heard of Popcorn Stories? I have to say that this is totally new to me. I received this guest post article and I thought it sound like such a fun idea. I can picture creating these stories with my children at school. One can just picture the giggles and laughs as they learn to create wonderful tales together. I have to thank Alisa for such a fun idea. An exercise that I've had great luck doing with children is called “Popcorn Story," which is based on the exquisite corpse method of writing first popularized by the Surrealists in the early 1900s. Of course, a name-change is in order for teaching it to kids, but the process is still the same: the group collaborates on creating or telling a story one sentence at a time. The first person writes a sentence. The second person writes a sentence to follow that sentence, and then the process continues until the entire class has participated. The exercise is wonderful for children because it taps into their unhindered urge towards creativity, while also requiring them to work their critical thinking skills. They must both follow along with the story as it develops and plan out their own contribution to the story. Because the story constantly changes, they must actively adjust their contribution to fit into the scheme of the story so that by the time it comes to them, they are ready to take part. But how could you apply this to preschool-aged children? Well, this exercise can be modified according to the class size, the time you'd like to devote to the exercise, and to the abilities of your young students. 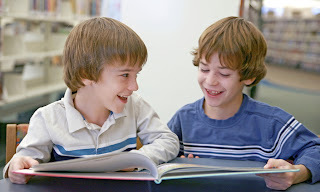 For example, instead of passing around a piece of paper on which each student adds his or her sentence, which would take quite a long time for preschoolers to accomplish, you could instead serve as the note-taker and write down each student's sentence and reread the story aloud for the next student. Furthermore, you could get rid of the text altogether and use images to tell a story. Additionally, you can choose to limit the students' abilities to see earlier versions of the story, which could create a whacky collage of funny and creative images and language that your students can play with. You can turn the story into a class book to send back to parents, an audio recording with instruments and so on, or a video. Essentially, the main point of the exercise is that your students collaborate on a learning project that both develops their creative spirit and helps them learn critical thinking skills. As the teacher, you'll want to decide how you will manage the exercise. What will you edit in the story? Will you censor unwanted items that could be offensive? Will you allow the class to revise the story? How will you determine the order in which the students participate? How much will you guide the students in the making of the story? Perhaps it will work best if you can link it to a theme of the class? In any case, it will take some trial and error, certainly, but eventually you'll find what works best for you class and what doesn't. This guest post is contributed by Alisa Gilbert, who writes on the topics of bachelors degree. She welcomes your comments at her email Id: alisagilbert599@gmail.com. This is a very nice ideas. I hope you could apply this in pre-school.